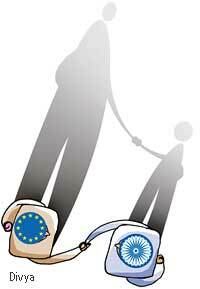 The European Union and India launched negotiations on a free trade and investment agreement in 2007. Brussels and New Delhi hope to seal an agreement by the end of this year. The Indian government claims it will be an agreeement between two equals. This is far from true. India's gdp is far below that of EU countries and it has a bigtrade deficit. But the Indian government is all set to eliminate tarrifs on 90 per cent of Indian imports from EU countries over seven years. Studies by several organizations in Europe show the pact will lead to job losses in India's food processing and automobile sectors. Financial sector liberalization could make loans out of reach of the poor in India. Farmers do not figure in any of these debates. But the pact will also strike at them. While India has overall trade deficit, its export of farm products exceeds its imports. The proponents of the pact peddle this as the basis to open our markets to products from subsidized farms in Europe. But the trade distorting subsidies to EU farmers do not figure in these negotiations. A free trade agreement with Brussels will weaken India's stand at the wto negotiations. India is one of the votaries of the special safeguards mechanisms for agricultural products at these negotiations. These provisions allow a developing country to raise tarrifs (to a level) when it faces a glut of imports or prices of imports fall drastically. But then how can one demand protection for farmers at the wto and open up the agriculture sector to a major agriculture exporter? The proponents of the free trade agreement do have a counter-argument. They claim that India will still be allowed to levy tarrifs on 524 sensitive products, 156 of which are agricultural products. Since this is almost double of what India might get at wto, it creates an impression that the free trade agreement protects agriculture adequately. But the list of sensitive products is all about retaining tariffs, while the special safeguards mechanism pertains to raising them. wto negotiations on agriculture has so far ruled out invoking special safeguards mechanism against imports under free trade agreements. So a pact with Brussels stands to undercut any gain from wto. The dairy sector, for example, will face a tough time. Seventy five million women and 15 million men, who contribute to a third of the gross income of rural households, will now face competition from Europe's subsidized farms. Some figures put the matter in perspective. In March 2007 EU governments gave their farmers a subsidy of more than US$ 550 per tonne on skimmed milk powder, US$ 850 per tonne on full-cream milk powder, and US$ 1,200 per tonne on butter and butter oil. Dairy products do figure on India's sensitive list. But the sector will not be able to withstand sustained competition against subsidized imports from the EU. As it is, dairy farmers subsidize domestic consumers in India. Thanks to disastrous domestic policies of the last 10 years and an indifferent National Dairy Development Board, a number of cooperative dairies across the country have either closed down or are on the verge of closure. The free trade agreement could be the last nail in the coffin of cooperative dairying. Intellectual Property Rights is another contentious issue. EU insists on International Convention for the Protection of New Varieties of Plants standards to protect the interests of its crop research and development corporations. The standards require countries grant patents to corporations. This runs contrary to India's Plant Variety Protection and Farmers' Rights Act which upholds farmers' rights to the country's genetic resources, including seeds. The free trade pact might result in small gains in apparel, construction and information technology sectors. But this will be at the cost of agriculture.